During a short snack break at Pleasant Flat Campground, just down the hill from Haast Pass, we ran into a few cyclists who were heading south after riding the west coast. The first cyclist, a young Asian lad hoped that we had enough bug spray as the “sandflies ate him alive”. The second cyclist, a German young man, was nearly in tears as he wolfed down his pasta out of a unusually large Tupperware container. “It rained so much, I regret having spent any time on the west coast. I was indoors all the time. If I was cycling I was soaked. I saw nothing. 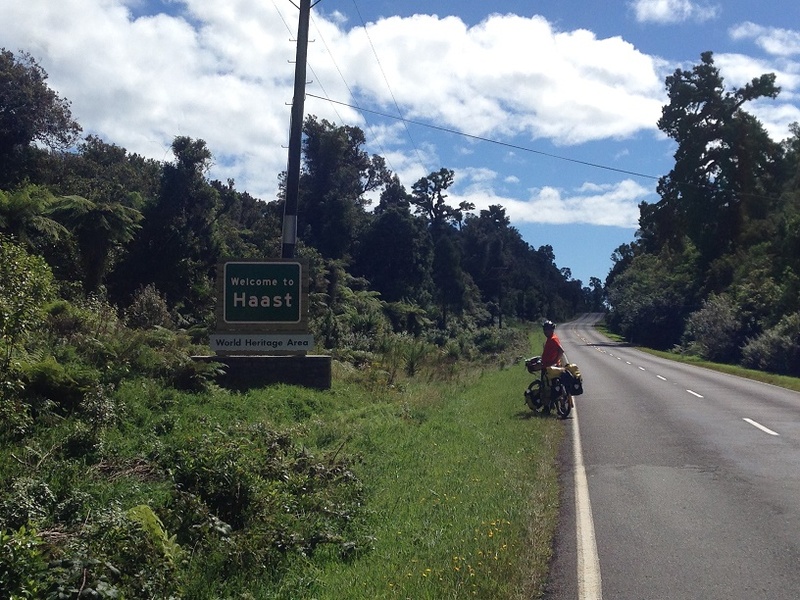 I will never cycle the west coast again.” He wolfed down his pasta and then happily headed up and over the Haast pass- away from the west, but not the weather (it rained for two days straight in Wanaka). 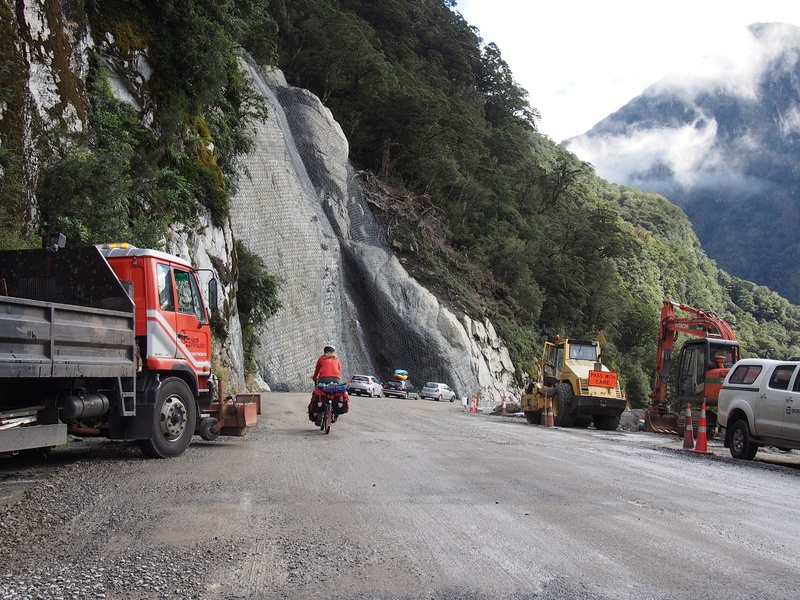 The roads are in constant need of repair due to the steep walls and unrelenting rain. Riding through a rain forest – beautiful. We remained unfazed as we had already been warned about the three forces on the west coast: rain, wind and sandflies. You are lucky if you only have two out of three. We opted to camp at Haast Beach – at the township. The French couple and our friends Kathryn and Brian both opted (smartly?) for a room in a Backpackers as the weather forecast was for, yes, you guessed it, heavy rain and winds. We camped. 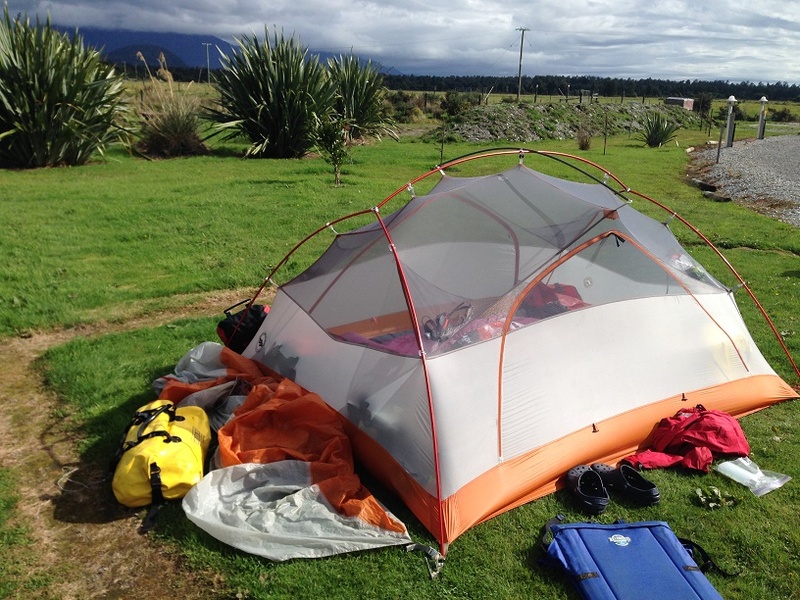 Our tent at Haast beach – just minutes before the deluge began. In the middle of the night, around 2:30 am, we awoke to gale force winds driving the rain onto the tent. Our Big Agnes Copper Spur tent held its ground – even if it did lean occasionally and temporarily bend the poles unnaturally. We decided to re-adjust the tent at about 10 pm during a short break in the rain to take the stress off the doors and realign better into the wind. This meant taking everything out, unstaking the tent, rotating it and putting everything back in. It was kind of like a comedy show. We were very glad we took the time to make the adjustments – as the tent leaned but did not cave in. We made it to morning – Jay slept, Janet did not. The inside of the tent and all our gear was amazingly dry. We packed up in the pouring rain with gale force winds – and decided to take a bus from Haast to Fox Glacier, 2 hrs by bus, 2 days by bicycle. The forecast was for 2 days of more rain – with a few breaks in the afternoons. Janet’s back was tired and she was kept awake by the pounding rain -so a bus it was. 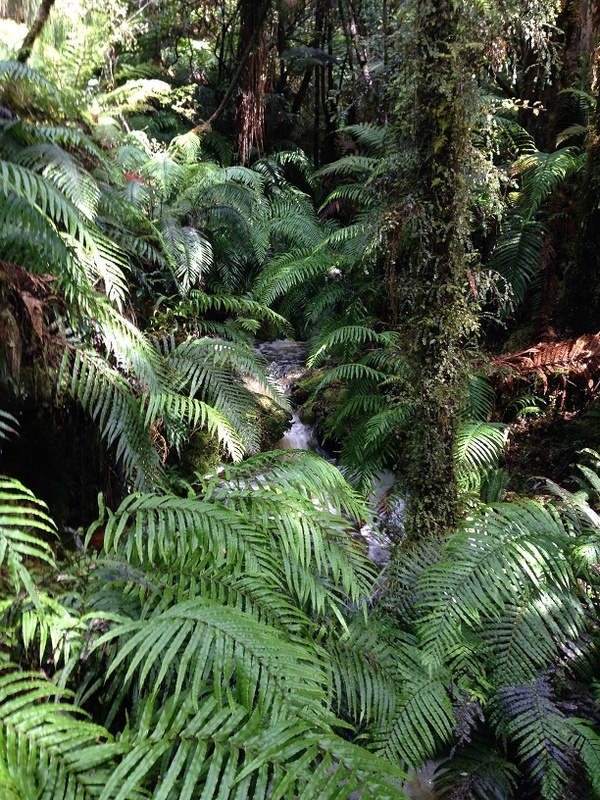 The dense foliage in the rain forest – with a small waterfall. As we rode the cushy Intercity bus with our bikes easily slid into the under carriage storage – with most of the gear still attached, we (well Janet) felt pangs of whimpiness when we passed Kathryn and Brain huddling from the rain at a pull out. Maybe it was not whimpiness, maybe it was relief for making a good decision. 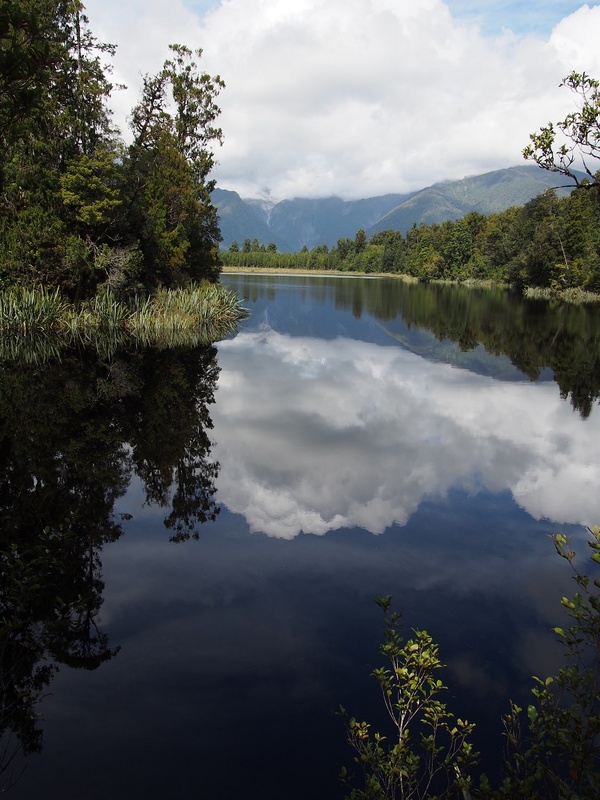 We had a lovely stay indoors at Fox Glacier and took advantage of a break in the rain to explore Lake Mathison – a mirror lake just west of the township. 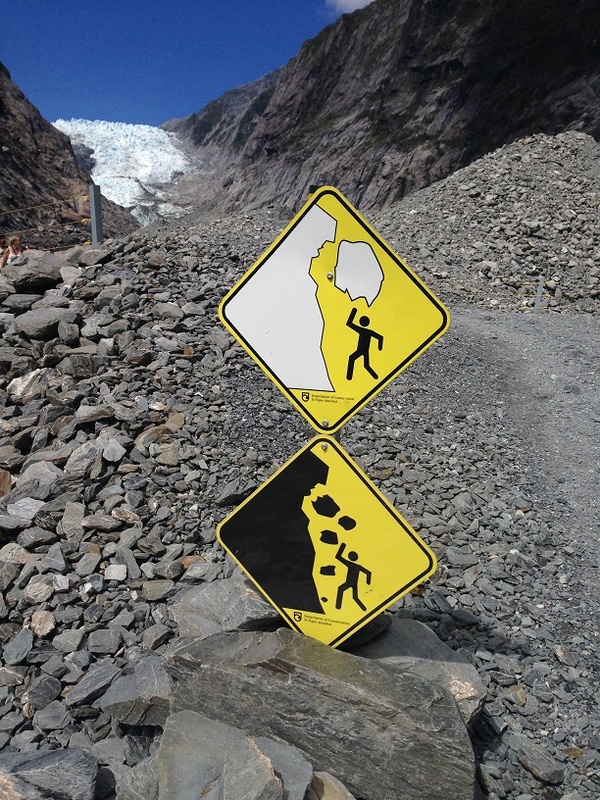 We were unable to visit the Fox glacier as the clouds were too low and the rain was wreaking havoc with the terminal glacier wall, making it unsafe to approach. 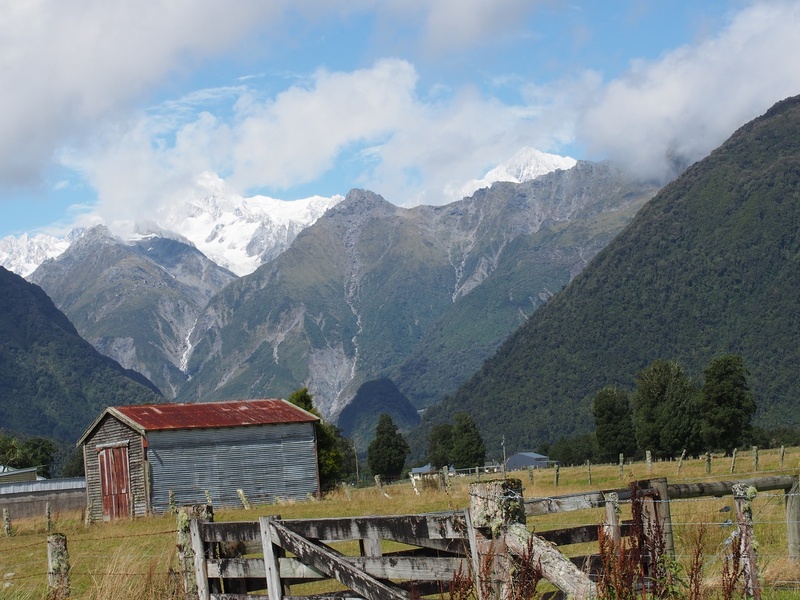 Mt Cook from Fox Glacier township during a rare break in the rain. 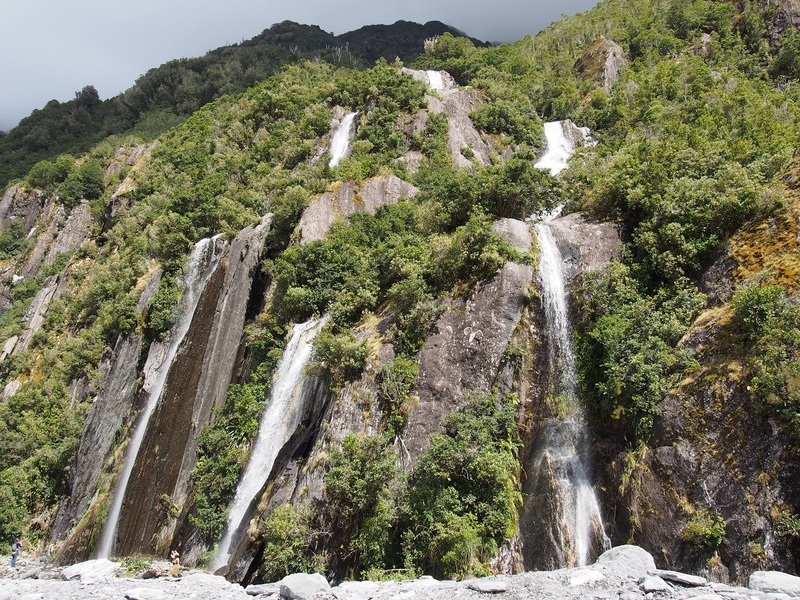 Lake Mathison – near Franz Joseph Glacier township. The rain settled in that evening and we met up with Kathryn and Brian, shared a bottle of wine and listened to their tales of riding in the rain. 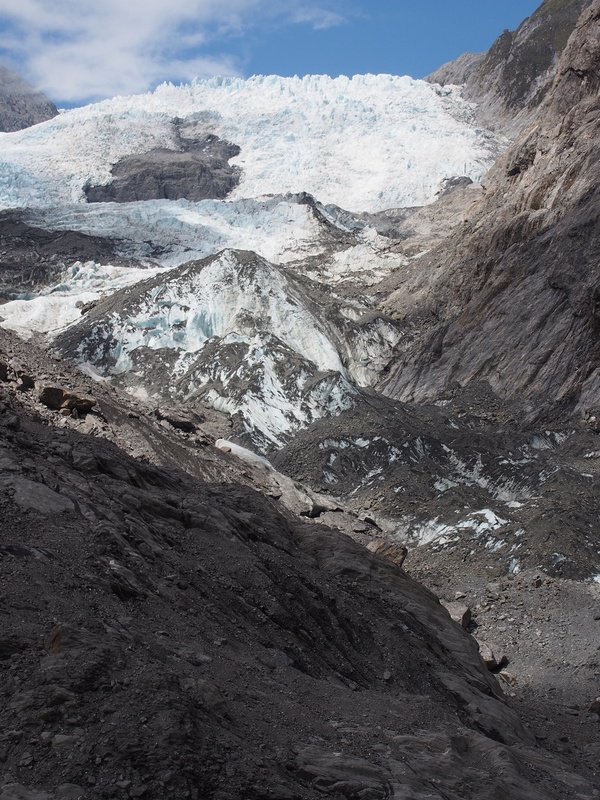 We left Fox Glacier knowing we had a short riding day with three fun hills on the way to Franz Joseph and the sun was shining – a real treat. After three thrilling downhills (which of course followed uphills), we rode up to the glacier parking lot on a lovely dirt track that winds through the thick rain forest. We were happy to find a bike shelter at the parking lot – very thoughtful planning! 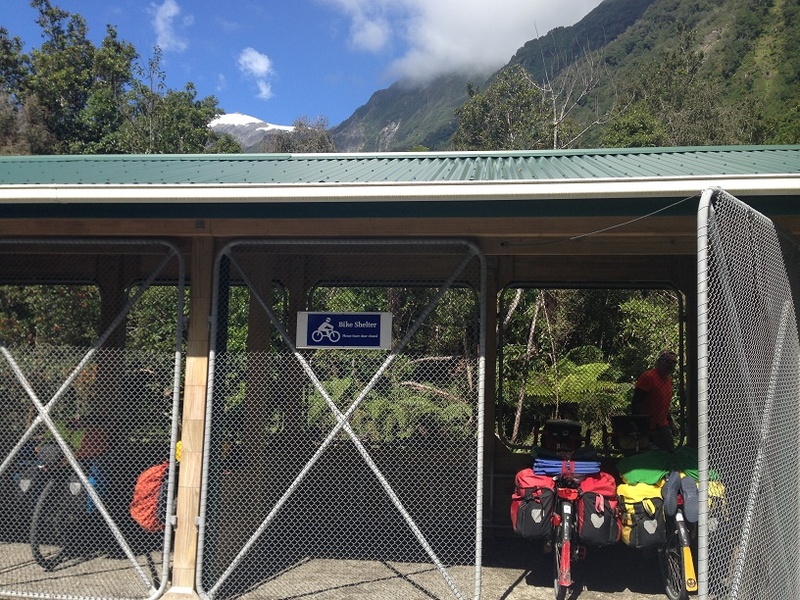 Bike parking at the Franz Joseph Glacier parking lot. Just as we started our walk back to our bikes it started to piss down rain. We had a fun downhill through the rain forest into town all in a downpour. We met up again with Kathryn and Brian for a lovely mixed Asian dinner in Franz Joseph township. I have never had garlic naan bread with my larb before. What did we learn in first few days of being in a rain forest? It rains, a lot. But, the rain makes everything green and beautiful and there are no sandflies when it is raining. The moments that the sun does break through the spectacular views and mesmerizing colors are worth every drop.